Brown Ash: my holy grail of basket-making materials. Not that it is or isn’t the best material (as if I’m qualified to opine on that point), but it certainly seemed the most daunting. In compiling my list of plants that I would try to learn about through basket-making, I included ash with the mental caveat that it was okay if it took me a few years to gather all of the necessary knowledge and assistance. I didn’t know that there was brown ash here until a friend happened to comment on it during a meandering Sunday morning walk through the woods. Once I had stopped and looked closely at the grey, corky bark (so much easier to do in three dimensions than by studying a photo), I saw brown ash everywhere! The low, flood-prone streamside land around my house is just full of it, in various stages of growth. I don’t enjoy asking for help. I like to feel like I’m self-sufficient, and able and willing to help other people. I couldn’t possibly cut down a tree [by myself], I don’t have a chainsaw so I couldn’t buck up the tree [by myself], and how would I get 12′ logs out of the woods [by myself]? The rest of the process, including removing bark and pounding the log, would also be totally new to me, but these things (I told myself) I could probably learn from YouTube videos. You know, if the tree felled itself and bucked itself up. What is a proudly independent woman to do? Oh, wait, right—I have a community, and these skills exist in my community, and if offering help builds relationships, then surely asking for help has a role, too. In a mentoring conversation, Trevanna suggested asking Trevanion if he would be interested in helping with this project, perhaps connecting it with the Northwood Village Day program by designating a part of the tree to go to the kids. So I did reach out to Trevanion, telling myself that it was really fine if he wasn’t interested, and that I could spend the next twelve months planning to make sure everything was in place for next spring. But when he did agree to help, and not just with the tree harvest but with teaching all stages of the process, I was flooded with gratitude and could then admit to myself that I was actually really, really excited. The following afternoon, I went out in the woods to visit the brown ash. That day, I didn’t have much confidence in my tree-identification skills. I hadn’t brought my tree ID book with me, and I only flagged two trees, immediately doubting the second one that I flagged. In the days that followed, I was busy, and then we got some bitterly cold, windy weather that made outdoor adventures seem less attractive. But I thought about the trees all the time. I dreamed about them, and the one that I saw over and over again was not the one that I had flagged. One thing that kept going through my mind was how to approach this harvest in a way that would be respectful to the individual tree and to its species and to the ecosystem that is this land. I’m coming around to the idea that there’s a role for positive human interaction with nature—that forming a reciprocal relationship with the land can be better, by some measures, than leaving it alone in an attempt to keep it “pure.” Maybe it sounds ridiculously sensitive and onerous to make all of these considerations before cutting down one tree, especially considering that I have three cord of firewood delivered to my house every summer. I am dependent on wood—wood that I don’t take responsibility for harvesting myself. But cutting down a tree? This feels more momentous than slaughtering a chicken, which was itself a milestone for me a few years ago. Why? Maybe it’s that the tree is so much older than any animal I’ve ever killed or eaten—possibly even older than me. Maybe it’s that it’s rooted in a place, and I’m taking it away from its neighbors. Maybe it’s that there will be an empty space left behind. I re-read the chapter in Braiding Sweetgrass about brown ash and the Pigeon family of Potowatami basket-makers who have been harvesting this tree and making baskets for generations. Robin Wall Kimmerer refers to a study that found that brown ash was in decline in some areas, but was thriving where there were communities of basket-makers. It found that the ailing brown ash populations had mature representatives and small saplings, but not many adolescent trees. In areas where trees were being harvested, young brown ash were able to take advantage of newly opened spaces in the canopy to shoot up and grow to maturity. And I read about the Emerald Ash Borer, which seems certain to almost completely wipe out brown ash within the next few decades. I tried to picture my land without ash. I grieved for these beautiful, elegant trees who are facing a death warrant due to their inability to mount a defense against an insect that we humans inadvertently brought to this continent with our global trading systems. I read about efforts to combat the Emerald Ash Borer by releasing parasitic wasps, and by stimulating trees to activate their defense systems (as the brown ash’s close relative, Manchurian ash, which evolved alongside this insect in Asia, is able to do). 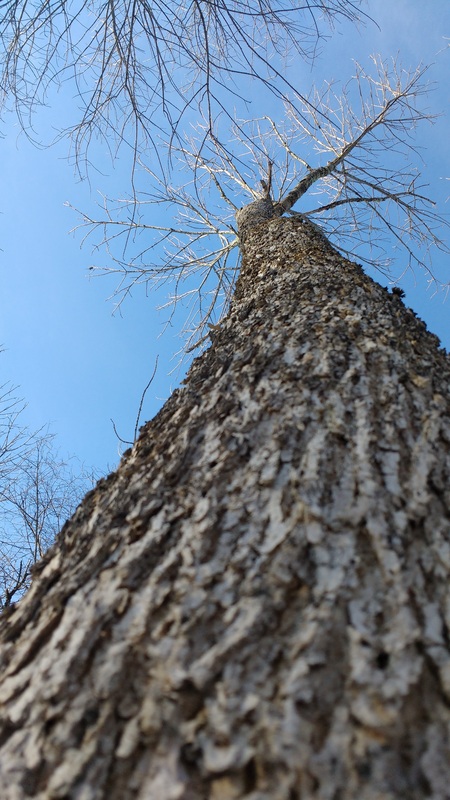 I also read about efforts to save seeds so that ash can be replanted after the EAB has killed every last ash tree in a geographic area, and moved on. I read about the agonizing decisions being made by people in areas already affected. Leave all of the ash standing, and hope that out of millions of trees in this country, a few will exhibit resistance? Or cut the ash while it still has value as timber, and before the market is flooded? Maybe, just maybe, there will be more answers and promising approaches by the time the EAB reaches Maine. 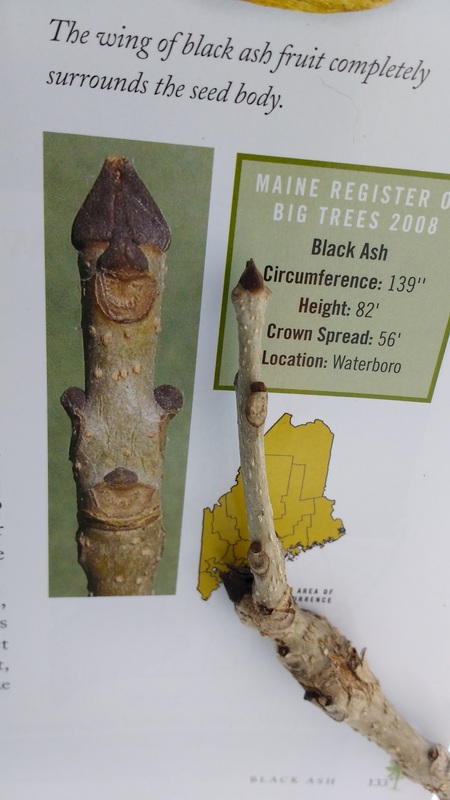 I found this compilation of information and resources from the University of Maine, which includes the brown ash’s importance to the Wababaki not just as an aside, but seemingly deeply integrated into the whole project. In planning this harvest, I knew from the beginning that I wanted to leave an offering for the tree. This is new thing for me, introduced through the Wildwood Path. As I experience it, it’s not a tribute to a god (or “the” god), it’s a physical representation of my gratitude, and a symbolic gift to the plant or animal or ecosystem. I’ve taken to carrying dried corn or peanuts in my pockets, and I often use those as offerings, although they don’t really feel like the right gifts to give to a tree. 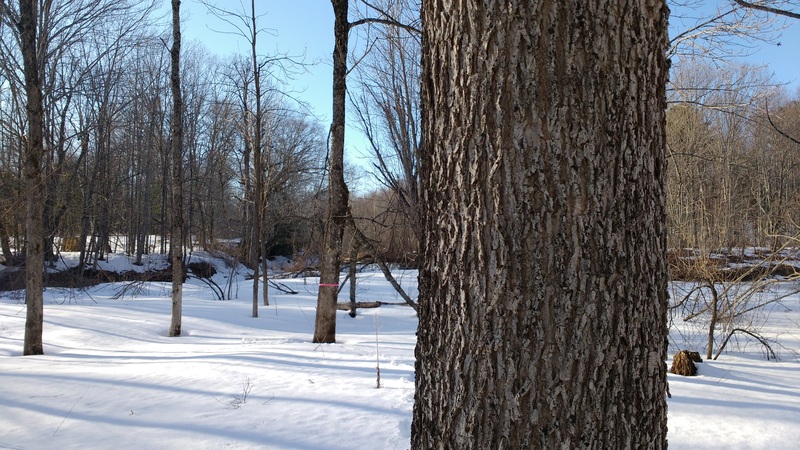 When tapping a maple, we gave water as an offering, which felt perfect—for a living tree. What to offer to a tree whose life I am ending? With the help of Google, I found a suggestion that rang true: a lock of hair. Cutting off a part of myself has resonance with cutting down a tree. Braided and bundled with dried herbs that I’ve grown, I can offer beauty, scent, and nesting materials for any birds who are disturbed by our loud springtime forest activity. On a leisurely 40° Saturday afternoon, a week and a half after my first attempt at flagging, I headed out into the woods. I wanted to find the tree from my dreams. And this time, the woods were full of brown ash. And I had more knowledge to help me confidently identify them. The corky bark was the first thing I looked for, and then I looked up into the canopy to confirm whether the twigs were thick and blunt compared with those of other trees. I brought flagging tape with me. During our December visit to Earthways, Ray shared that he flags trees long before cutting them, so that he’ll have multiple chances to walk back through the grove, rethinking his choices. I flagged trees that seemed like possible candidates, by various criteria that I, who have never cut down a tree, imagined might be relevant. Some trees were straight and tall, with little branching. Some trees were thick (17″ in diameter, in one case!). Some trees were damaged and at risk of rot, and others were attractive because of their surroundings: enough space to drop without damaging their neighbors, but with saplings nearby poised to take advantage of the increased sunlight. For this last test, I needed to identify brown ash saplings, before they had developed their signature corky bark. Luckily, with these small trees I could study the buds up close, and experience the satisfaction of a very confident match with the photo in my copy of Forest Trees of Maine.